As of 2015 Kirby is no longer playing in Branson. 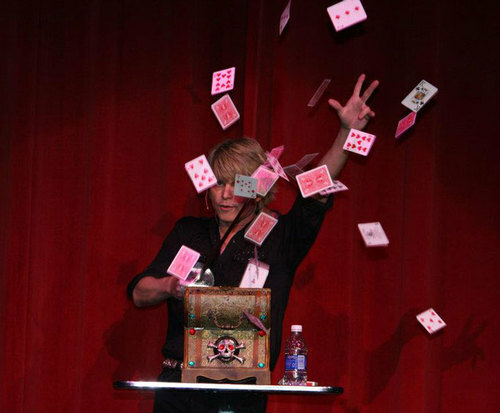 One of the world's most skilled magicians, Kirby earned the title 'Prince of Magic' and his up close and personal show will leave you in awe. 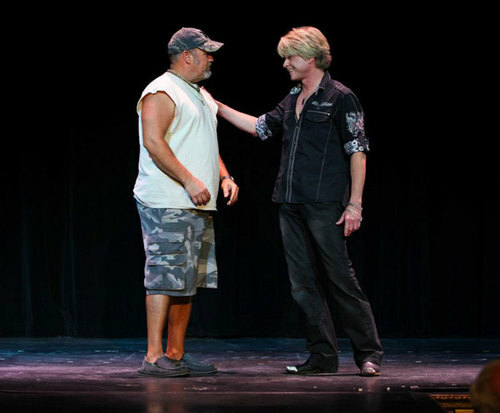 After years of large scale illusions and magic tricks in Branson, Kirby is now introducing more intimate magic show, as he invites you and your family to experience his illusions up close and right before your eyes. Experience the incredible sleight of hand that Kirby has perfected throughout his years of entertainment as he gives you a glimpse into the world of magic with unbelievable mind reading, levitation, sword play, card tricks and more. He'll have you completely puzzled as he pulls off illusion after illusion with ease. 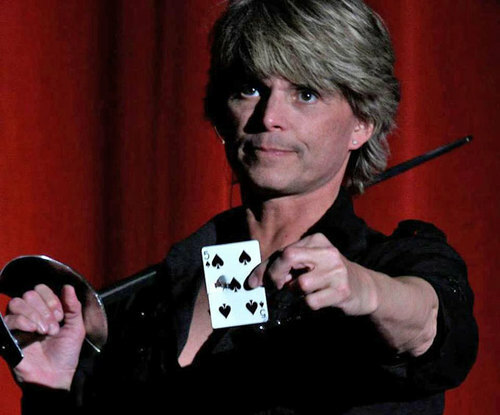 Joining him onstage is the lovely Bambi VanBurch, the world's most awarded female magician. Her astonishing mind reading skills will have you wondering just how she does it as she recites the serial number off a ten dollar bill plucked from the audience and correctly identifies random audience member's belongings, all while being blindfolded on stage. These two seasoned performers will spend the majority of the show down in the aisles of the theater with you, so get ready for lots of audience participation and keep your eyes peeled, because you really won't believe these mind-boggling illusions. Kirby's love for magic began at age seven and ever since then his passion has been entertaining those around him with unbelievable illusions. He first conquered the simple tricks and then eventually mastered bigger and more difficult ones. Kirby moved to Las Vegas and became the youngest star in the downtown 'Glitter Gulch' and his success quickly followed. Large crowds flocked to his productions in Nevada and he gained national attention with a death-defying escape stunt that resulted in his induction into the Ripley's Believe it Or Not! museum collection. He traveled the world performing in more than 37 countries and his nickname the 'Prince of Magic' was given to him by the princess of Thailand after he was invited to perform at the Royal Palace there. Bambi started her dance career at the young age of five and continued performing through high school and college on dance teams. She auditioned for the Kirby VanBurch show in 2002 and began performing as a dancer and assistant and worked her way up to the leading female magic assistant. Falling in love with the art of illusion, she perfected the craft and earned awards such as 'International Female Magician of the Decade,' 'International Female Magician of the Year' from 2007-2009 and 'Illusionist of the Year' at NBC's World Magic Awards. My husband and i were at the show about a month ago and we really enjoyed it. My husband is not a big magic fan like me growing up with david cooperfield and totally loving it. But we both really enjoyed the experience. Both kirby and bambi are wonderful performers and very enjoyable people, though both my husband and i are still sure we have met them somewhere before. Going back to see the animals after the show was amazing in so many ways and very impressive as to the level of care they take for these amazing creatures. They do a meet and greet with everyone afterward and you don't get that level of appreciation from many performers anymore. Thank you both so much for a very enjoyable evening and we do plan to come back and see them in the future. Hopefully closer to home next time. I have enjoyed magic all my life and have seen many of the big name magicians and have swopped stories with many amateurs of the difficulty of different illusions. Kirby’s illusions are as great as any i have ever seen and better. His humility and down to earth approach to his craft is inspiring to all and his showmanship allows the audience to feel connected to him and the performers who accompany him. I came away uplifted, amazed, and inspired. Kirby, thank you! "The show was top notch." The show was top notch. I would recommend this show to anyone. Kirby and bambi was superb and entertaining. I also loved that he shared his christianity and his love for christ in the show. He was as good as anyone, even david copperfield. We loved it!!!! Show was entertaining. A crowd of only 11 people seemed to keep the excitement level down, but the performance was very good. We had not seen the illusions before.